After almost two years sailing in the dark, it's great to finally have the first issue of Daytripper on the stands, on everbody's hands, on so many reviews. And it is also good to look ahead and see where we are taking the readers. It's a long journey and we have just started. At the Vertigo Blog, you can find a very interesting line-up of artists. To be on the same book as them is thrilling. When I agreed contributing, I had no idea who else would be on the book. I did my best, and I'm very happy with my pages, but right now all I can think of is "what will everybody else on the book be doing?" Every new day something can happen or you can meet someone that will change your life forever. These kinds of surprises make life an adventure and that's the kind of feeling we want the readers to have on Daytripper, our new 10 part limited series at Vertigo. We gave an interview to Comic Book Resources a month ago about the series, and another to Newsarama this week. We've written about the concept of the story and talked about our literary influences. Our editor Pornsak has a delightful input on the process of getting the first cover right over at the Vertigo blog (and that's not even half of it). Enough talk. It's time. Daytripper is out today and it will change everything. "Have you ever realized how our lives can change at any given moment? Have you noticed how we can plan ahead all we want, but we're always surprised by the unexpected? And that, afterwards, we end up with a sum of moments, both good and bad, that really define who we are, what we want, and what we love? Well, such roller coasters of ordinary life happen every day, and that's what DAYTRIPPER is about." That's part of our "On the Ledge" text that can be read on every Vertigo book this month and also here. 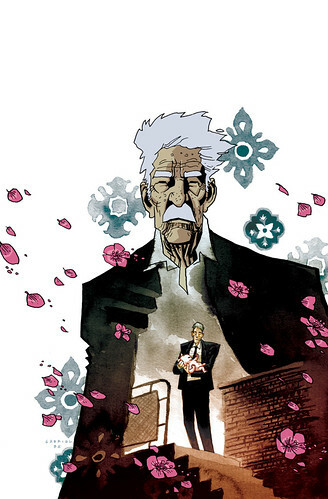 DAYTRIPPER is 10 issues mini-series and it's a story about life and all the little moments that ask the big questions. It's an adventure just like life itself, a journey where it's not so important where you're going, but how you get there. Fábio and I are really excited about this. More than the day this idea struck me, more than the day the project was accepted, now the time has come for it to become a reality. We gave a long interview to Comic Book Resources almost a month ago about the series, but now this is actually happening and we want everyone to be there when it does! I was talking to Gerard last week, chatting about life, traveling, comics and music, and we talked a lot about Daytripper. How could we not? Fábio had the camera ready and we got it all recorded, just so we could share this very special conversation about our very special project. DAYTRIPPER #1 will be on the stands this wednesday, December 9th, and you should all go to your favorite comic-stores and be part of this story. A week from now, Daytripper will hit the comicshops all around the U.S. (all around the globe, soon after that). A week from now, what started with one sentence and became an idea, what had been our first ever pitch to anything and turned into our first Vertigo project, a series of 10 chapters, will finally become a reality. A week from now, Daytripper will change our career. It will change our lives. It will change yours too.